Auditorium area was defined as the controlled patron/spectator area from stage apron to back gate or security barrier and included aisles and tech booths—a pretty traditional definition. Google Maps was used to measure the area of each venue's auditorium. The images below are the actual Google images and measures used. Wide perspective images are also include as the partaking data came from counting stalls. The wide perspective images also gives you a good feel for each venue's infrastructure and amenities. Anyone using Google Maps and its builtin measuring tool can verify these measures. [Revision-B, 2018 January 29. 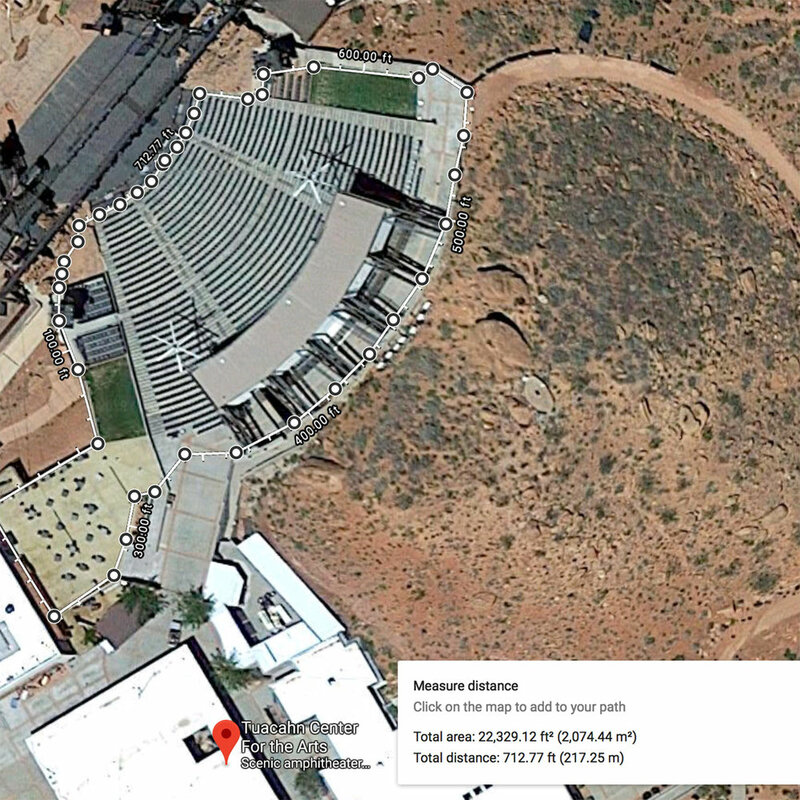 After surveying Tuacahn (St. George) Sunday, 2018 January 28, we realized we had mismeasured—Tuacahn's auditorium area now includes the restaurant patio, the patch of standing area stage right, the premium suites and the vomitorium under them. This expanded survey takes Tuacahn's auditorium area to 22,400 ft^2, up from the 19,000 ft^2 we had originally noted]. Population estimates: Salt Lake City 198,400 (and yes, SLC pulled the plug on the very successful Twilight Concerts held in Pioneer Park due to continued cost to tax payers*). Saint George 86,700; Sandy 99,500; Ogden 89,500; Layton 78,800; Draper 45,700; North Ogden 19,500. Quality of infrastructure is somewhat subjective, but still, you can get a good taste visiting them. As for NO's amphitheater plans, since we have not yet been given access to the detailed engineering drawings (NO City sighting copywriter reasons...) we used the NOC Noise Levels Day dB(A) Map dated 8/22/2017 (available at the NO City offices) as well as the top view architectural sketch found in the NO Amphitheater Method Studios Presentation PDF found on the NO City website. These two sketches were imported into Vectorworks CAD software and area was confirmed, 60,000 to 68,000 ft^2 using the same definition of auditorium. Even using Google Maps, or walking the current NO Amph site, you can get a pretty clear idea of this things expanse—measuring on site we arrived at a gated diameter of 285 ft [90m] which is about the diameter as the bowl, which the fence will sit atop, and then we subtracting the greater stage area. Red Butte Patron Area 53,500 Sq. Ft.
Gallivan Center Patron Area 34,400 Sq. Ft.
Ogden Amphitheater Patron Area 29,000 Sq. Ft.
Sandy Amphitheater Patron Area 42,800 Sq. Ft.
Draper Amphitheater Patron Area 19,700 Sq. Ft.
Layton (Kenley) Patron Area 19,250 Sq. 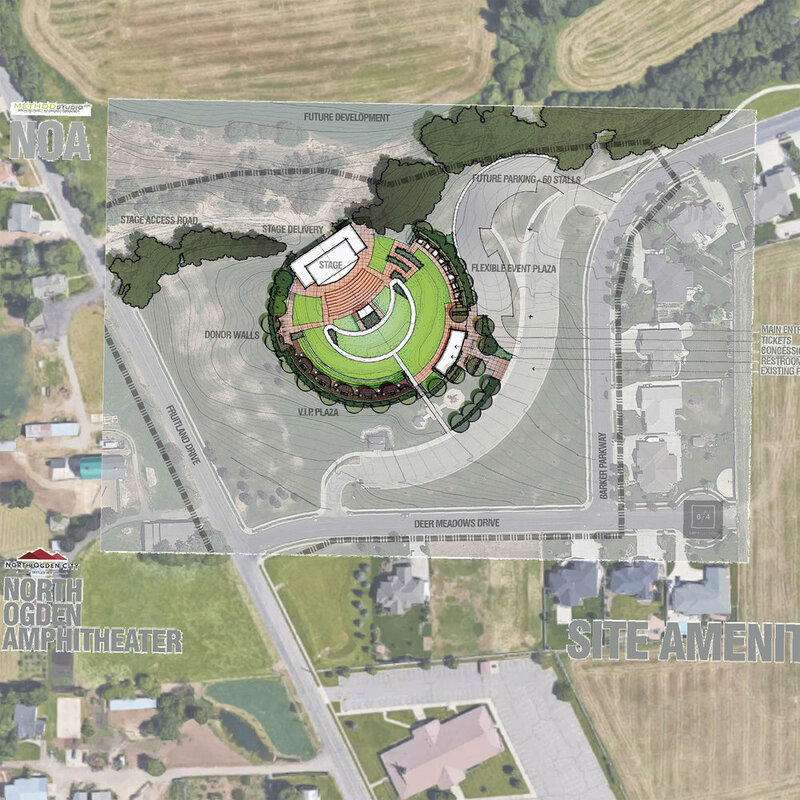 Ft.
NO Amphitheater 2018 Patron Area 64,000 based on the same criteria used on all other examples..